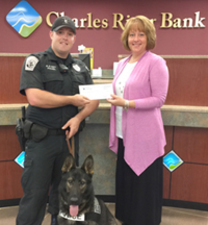 Charles River Bank recently donated $500 to the Mendon Police K-9 program. Nancy MacLeod, Assistant Branch Manager of Charles River Bank’s Mendon office, presented the donation to Officer Matt Pichel, who manages the K-9 Program in Mendon, and his German Shepherd K-9 partner Brady. Mendon began the K-9 program in December of 2015 with a grant from the Stanton Foundation in an effort to better patrol the town. Brady has quickly shown his value to the Mendon Police Department and in March he even helped locate a missing teenager. To establish the K-9 program and certify the pair, Officer Pichel and Brady have had to successfully complete over 600 hours of training. In August, the duo began training again at the Boston Police Department K-9 Academy, this time specializing in narcotics. The Mendon Police Department hopes that Brady will become a dual purpose dog focusing on both patrol and narcotics. The donation from Charles River Bank will help the police force acquire a new, specially outfitted police cruiser for Officer Pichel and Brady. “As a Mendon resident, and dog lover, I am especially proud that our bank can help the Mendon Police Department fund the K-9 program. Our community will continue to benefit from the specialized law enforcement techniques and safety programs that Officer Pichel and Brady can provide,” stated Charles River Bank President & CEO Jack Hamilton. At the beginning of September, Ann Sherry (above, center), Charles River Bank Senior Vice President of Customer Care and Relationship Development, presented a donation check of $1,000 to the Medway Mustang Gridiron Club. Cheer and football captains (shown above, L-R) Sarah O’Connor, Dylan Ehrmanntraut, Patrick Travers, and Julianne Pratt were on hand to accept the check from Sherry, in support of the 2016 season. 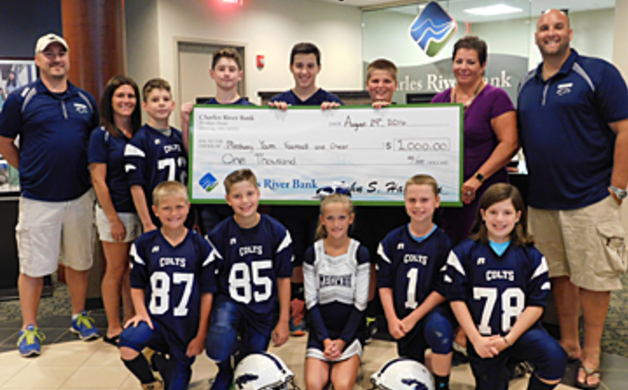 Ann Sherry, Charles River Bank Senior Vice President of Customer Care and Relationship Development, was on hand recently to present a donation check of $1,000 to Medway Youth Football and Cheer’s President John Farrell, Treasurer Cheryl Richardson, and Vice President Matthew Applebaum, along with members of the football and cheerleading teams, to support the 2016 season. 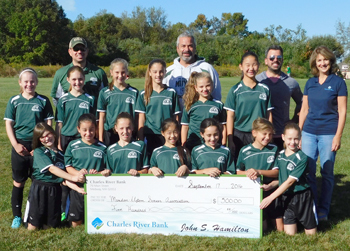 Ann Gonyea, Charles River Bank AVP/Mendon Branch Officer, recently presented a donation check of $500 to Mendon-Upton Soccer Association’s Dave Kirby, Robert Cavanaugh, and Jonathan Harvey, along with members of the girls soccer team, in support of the 2016 season. Charles River Bank—with assets of $225 million—was founded in 1915, and continues to offer a wide range of individual and business banking services. The Bank's Main Office is located at 70 Main Street in Medway, and new state-of-the-art branches are located on the Bellingham/Franklin town line on Route 140 at Maple St., and in Mendon at 1 Hastings Street, and at the intersection of Rte. 16 and North Avenue. Charles River Bank also operates a branch in Medway High School that serves as an educational facility and full-service branch. In 2015, Charles River Bank contributed more than $40,000 to community non-profit organizations.